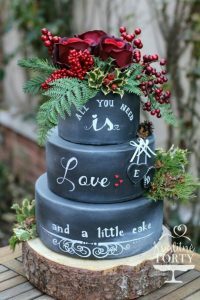 In the Past, most of all during Romanticism, the language of flowers were used to communicate messages and express each kind of feeling, especially love. In our present flowers have a massive importance too, in some occasions, like the wedding, are even fundamental. 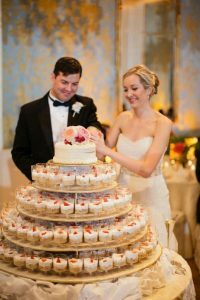 It’s not a case that the firsts images that we associate to the idea of wedding represent a wonderful flower arrangement or a delicate bouquet. But, if today the function of flowers is essentially decorative, in the past they were actually used in order to express many meanings, both religious and symbolic, depending on the country and its culture, and often on the historical period. 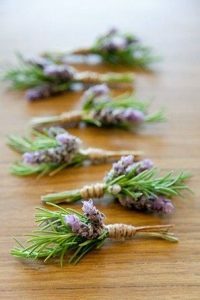 In Ancient Egypt – that is, according to some sources, also the bouquet’s historical homeland – people used aromatic herbs, often with garlic, to protect bride and groom from mean spirits. 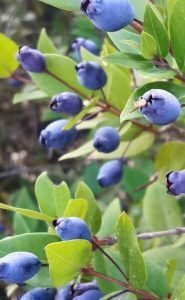 A similar custom was common also in Greece, place where the myrtle, considered sacred to Aphrodite, was a symbol of love, beauty and energy. 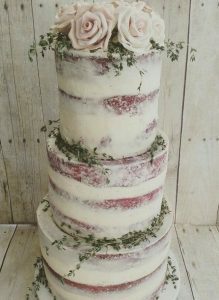 In England too, during the Elizabethan Age, the aromatic herbs were the plants which accompanied the bride, especially rosemary that, picked up in small bunches, symbolized memory and loyalty. 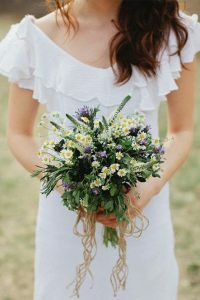 As the years passed, the early bouquets began replacing the aromatic herbs, even though their purpose was neither to express emotions nor to embellish the bride. In fact, during Middle Age, because of the lack of hygiene, the flowers were the only “natural” method to contrast the bad smell of bride, groom and guests. However in Italy, during the invasion of Sicily by Moors, that took place between VII and IX’s century, the traditional habit, from Arabian culture, to adorn the bride with orange blossom were introduced. 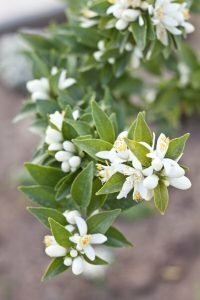 The orange blossom are nowadays considered the flowers dedicated to the marriage par excellence, in order to wish prosperity and happiness to the couple, and as a symbol of bride’s virginity and purity. Another uncontested bouquet and flower arrangements’ queen is the rose, inspirational muse of artists and poets, who defined it the “queen of flowers”, “daughter of the sky” and “glory of spring”. 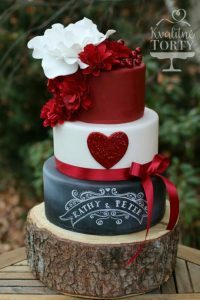 But, as many Flowers Dictionaries say, not all the roses are good for the wedding! 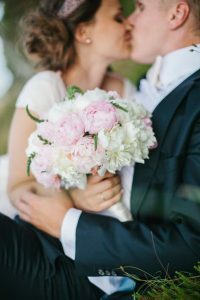 At least according to the language of flowers…it’s clear that in modern weddings there are other causes that influence the choice: personal taste, season, budget and style of the wedding. If you need other information, just write to me! Today our adventure begins in a place that houses people’s dreams, for its landscapes’ beauty, the enchanting beaches, the uncontaminated and wild nature. A place where the shore of the crystal clear sea is a few steps away the thick and verdant forest, and where the gaudy colours of the flowers fill the eyes. 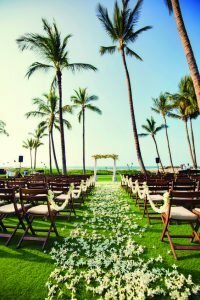 A place that preserve the tradition of the past, and customs and symbols of the ancient nuptial ceremonies: flowers’ garlands… hula… the blowing of the shell… welcome to the Hawaiian wedding. 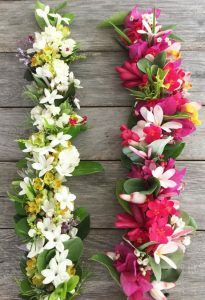 The element that most of all represents the Hawaiian culture is of course the garland, called Haku Lei, a traditional floral composition, formed by about 50 flowers connected with a ribbon. It is worn around the neck or on the head to celebrate a special occasion or donated as symbol of affection. During the nuptial ceremony, the bride wears the Haku Lei in substitution of the voile, realized with pikake (white jasmine), tuberoses or ginger’s white flowers. The groom wears instead a garland made by maile’s leaves, braided with white jasmine or tuberose’s flowers. 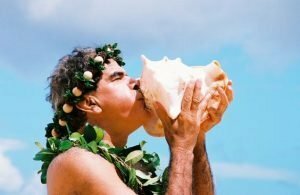 The wedding ritual begins with the triple blowing of the Pu, or conch shell. This gesture pay homage to Christianism, considering that the three sounds represent the Father, the Son and the Holy Spirit, and so the intention of the couple to follow the Christian values in their new home. 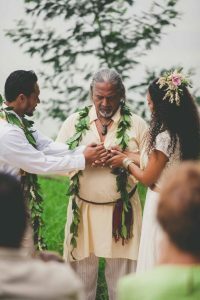 The ceremony is celebrated by a kahuna pule (minister), who formalizes the bond of the couple uniting their hands with a maile’s leaf. 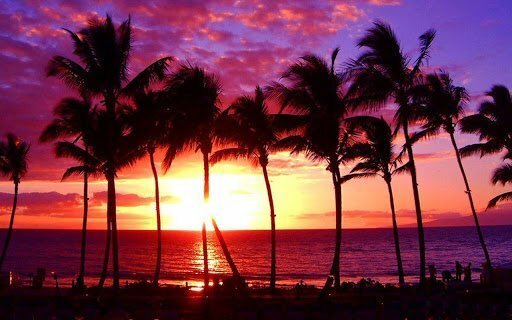 Another typical symbol of the Hawaiian archipelago is the hula, an ancient and sacred dance that expresses feelings or tells a story. 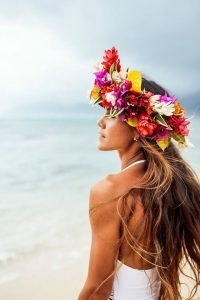 In the traditional ceremonies, the type of hula was chosen in order to narrate the story of the couple; but nowadays the hula is just a form of entertaining. 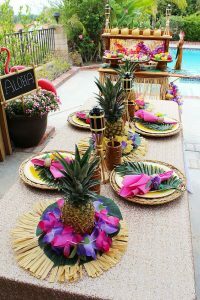 After the ceremony they celebrate the wedding reception, called luau. The main course of the party is the kaula, pork cooked for an entire day in an underground oven. Other typical dishes are: poi (colocasia esculenta’s root pasta, similar to the potato), kufolo (a custard of colocasia esculenta and coconut), lau lau (pork, beef or fish, salted and rolled up in ti’s leaves), poke (seasoned raw fish and algae), tropical fruit and more meat, poultry or dishes based on seafood. During the entire party the typical music, with drums, guitars and ukuleles, makes the atmosphere happy. I’ll be expecting you next month with a new ritual around the world ? 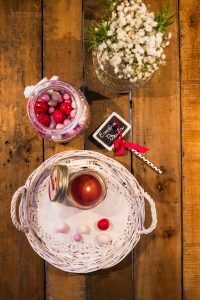 The party favours are, especially in Italy, an essential element for each kind of event: from the baptism to the graduation, the holy communion to the anniversaries, and of course the wedding. It represents not only a memory of the special day, but also a way to say thanks to all the people who participate, with their physical presence or with a simple gift. Its custom has very ancient origins, and during the ages it changed many times, except for an “ingredient” which remained unchanged: the sugared almond, called “confetto” in Italy. 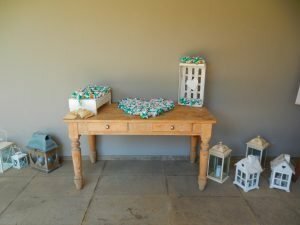 Party favour, “bomboniera” in Italian, comes from the French “bombonnière”, a term that in the XVIII century indicated a small box containing the typical sweets in that periods, the bon-bon, which were almond covered with honey. 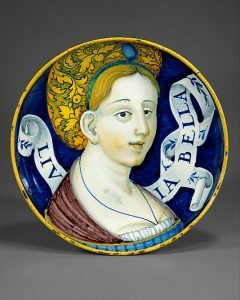 However, in Italy were already common in 1400, when, for their engagement, the future bride and the future groom, with the respective families, gave caskets or small boxes for sweets to each other. 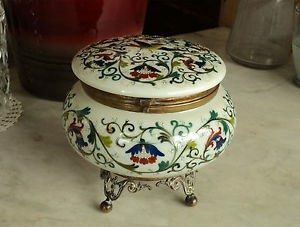 Moreover, the day of the wedding, the groom used to donate to the future wife a “coppa amatoria”, a ceramic cup full of sugared almond, symbol of prosperity and fecundity. 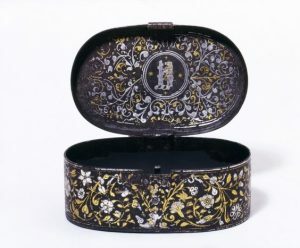 In England instead, in 1500 was common the habit of the “sweetmeat box”, containers realized with refined materials and decorated with precious stones, containing sugared almond or sweets. 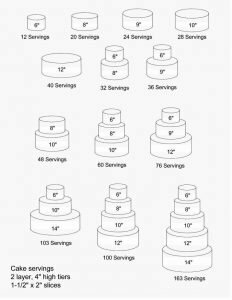 A research says that during the celebration of New Year’s Eve in 1574, Queen Elizabeth I received a lot of sweetmeat box as wish for the new year. But is in 1896 that the party favour assumes the meaning that today we associate to it. 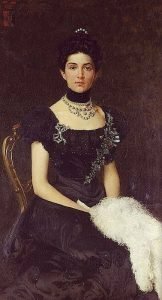 It seems that at the wedding of Vittorio Emanuele, Prince of Naples and future King of Italy, and Elena del Montenegro, the invites brought the party favours as gifts, making them become the official gift of the marriage and beginning the tradition. 1 “confetto” means the uniqueness of the event. 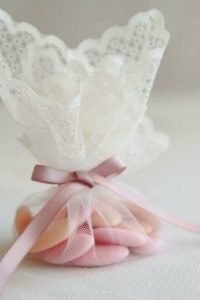 The colour has for tradition a significate associated to the type of ceremony: light blue or pink for baptism, pastels sugared almond or multi-coloured for birthdays, and classic white for holy communion, confirmation and wedding. If you’re curious to know more anecdotes about party favours and sugared almond, write to me! It doesn’t matter what kind of movies or tv shows do you like most, you must have seen it once! And probably, it made you daydream, giving you inspirations and ideas or simply sighs of adoration! 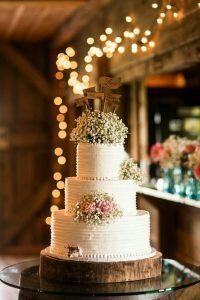 I’m really talking about it… the American wedding! Ceremonies on the beach, exotic garden and luxury hotels. Brides that arrive aboard a carriage or a Harley Davidson. Unchained receptions until late at night which involve dj, band, dance crew, fireworks, caricaturist, magician and invite with innate talent as comedian, dancer or singer (or stripper!). Joking aside, it’s obvious that in the States the marriage is an event to celebrate grandly and often, if the economic conditions allow it, it lasts also more days. 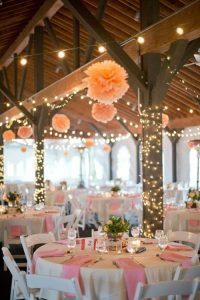 Think about, for example, at the famous bachelor or bachelorette party, organised respectively by the best man and the maid of honor, who will be the two people that, more than everyone else, will help groom and bride organising the wedding. This is the reason why usually this role is given to best friends or siblings. Another typical tradition that precedes the wedding day is the wedding rehearsal, during which all the fundamental moments of the ceremony are coordinated, such as the entrance of bride and groom, bridesmaids and groomsmen. After the wedding reharsal, usually the night before the wedding, they organize the reharsal dinner. 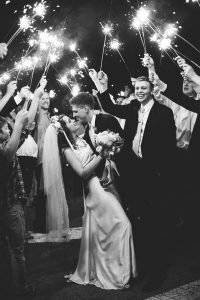 Bride and groom reunite some of the guests, generally close friends and relatives, in order to thanks them and, if they didn’t before, to make them meet, so they all can spend a pleasant night together. 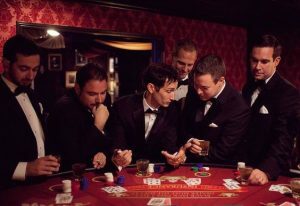 Activities generally include toasting (or roasting), from roast, a form of American humour in which a specific guest, is subjected to jokes at their expense, intended to amuse the rest of the “audience”. 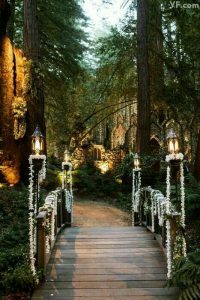 Ceremony doesn’t consider a unique and specific ritual: because of the large amount of different culture which coexist in United States, it’s not rare the bride professes a different religion than the groom. In these cases, or they choose one of them, or the wedding is officiated by a state official. Of course there is nothing to prevent them to celebrate two ceremonies! 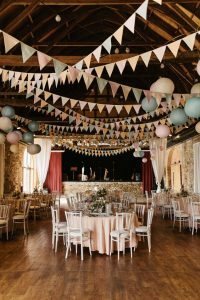 For the reception there are many possibilities and obviously they choose location and method considering style, theme and most of all financial means. 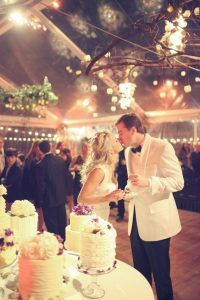 Often bride and groom don’t stay until the end of the party, but they prefer to leave for the honeymoon in the middle of the reception. 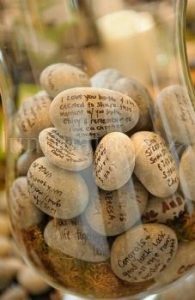 In this case the parents say goodbye to the guests and donate them the party favors. But if they prefer to greet and thank the invite in a very special way, they organize a brunch the morning after the wedding. If you are curious to know more about the American traditions, don’t hesitate and contact me! 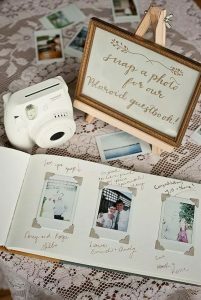 Considering the funniest and most particular trends that comes from the States, photo booth and guest book are an excellent solution to involve your guests and entertain them during the wedding reception. 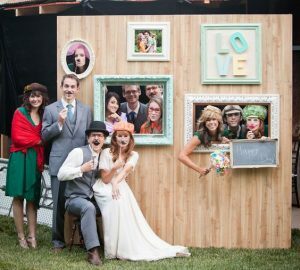 Photo booth, which is literally the “cabin” where the passport photos are made, has been readjusted, referring to events and weddings, to indicate an extravagant photo shoot during which people use wigs, masks and crazy accessories. 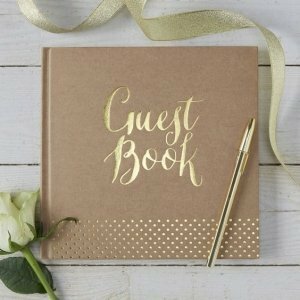 The guest book is traditionally a book where the guests can sign or write special dedications, but recently bride and groom personalize it with other “memory ideas” even more original and strange. 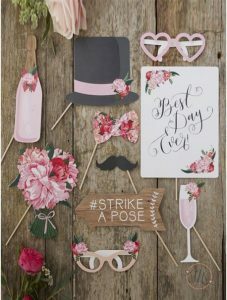 For the photo booth area the most simple choice concerns the accessories in coloured cardboard, which are easily available online: glasses, fanny hats, champagne flutes, mustaches… If you want to make them more interactive you could create white speech bubbles, so that the invites can write on them what they want. 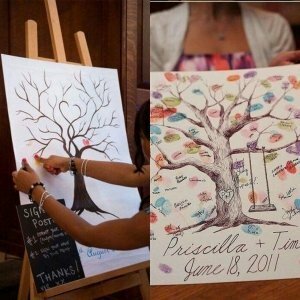 In this way you avoid the risk of a boring album, moreover you give the occasion to the more creative guests to express themselves! 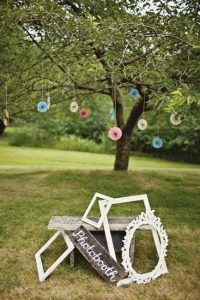 If you desire to realize some decorations on your own, you can create some frames perfect for the group pictures. 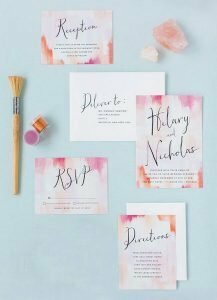 They can imitate the socials’ screen, like Instagram, or adapt to the wedding’s style. 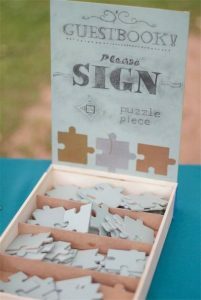 The frames can also be incorporated in particular themed structures: vintage sitting room, Barbie and Ken’s boxes, museum’s wall, ice-cream truck, fantasy background…use your creativity! 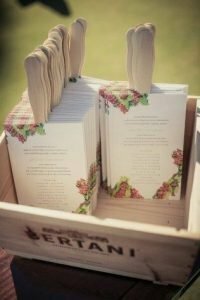 The guest book is, with the photo album, the collection of all the most beautiful memories of the wedding, but the difference is that the guest book is completely managed by the invites! The album, more than dedications and signatures, can contain Polaroids realized with specific cameras made available to the guests. But if you don’t want that these memories remain a simple book to leaf through, you can make them pieces of furniture! 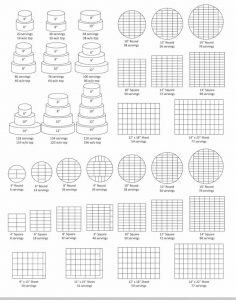 Puzzles to sing that you can complete at home and then hang; stones or little stones to insert in vases, pitchers or jars; wooden hearts or carved bark; easel, canvas and tempera for artistic or personalised paintings, such as the “imprinted” tree or balloons. 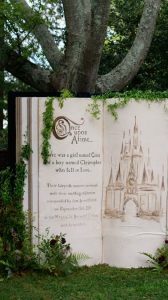 The ideas are really numerous and if you like the option of the photo booth of guest book area, don’t limit fantasy and originality! 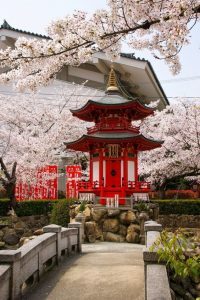 Our travel throughout the rituals around the world continues, leaving Japan and moving to India, a country symbol of fascination, extravagance, uncontrolled dances, gaudy colours and spiced aromas. 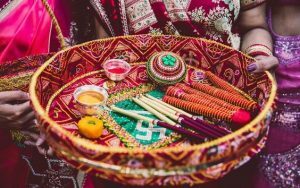 The celebration of Hindu wedding is characterized by a sequence of rituals, in order to wish good luck and prosperity to bride and groom, and to unite the family too, which after the marriage will share an indissoluble bond. 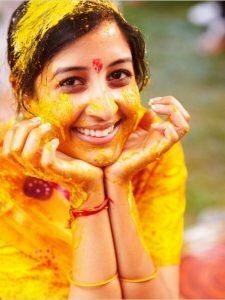 Two or three days before the wedding they celebrate the Haldi ceremony: during this celebration the guests apply a paste based on curcuma, chickpea’s flour, sandalwood and roses’ water on bride and groom’s hands, foot and face, in order to light up their skin and wish them good luck. The day before instead, just like a bachelorette party, the bride with her female friends and relative decorate her hands and foot with hennè, within a technique called Mehndi, to celebrate the journey to the marriage. At the same time a Mandapa, a big gazebo, is built and decorate with flowers in the location chosen for the celebration of the wedding. The ceremony starts with Baarat, the groom and his family’s arrival, that is honoured by the bride’s family during the Milni ritual. In this ritual each participant receive a marking on their forehead with red kum-kum, a powder based on curcuma and saffron. After the families’ encounter and the adoration of Ganesha, the destroyer of all the obstacles, bride and groom go to the altar. The groom is the first person who enters and drinks a celebrative beverage. The arrival of the bride, dressed with the traditional sari, is called Kanya, and when she is near the groom they exchange the flower garlands, in a ritual called Jai Mala. 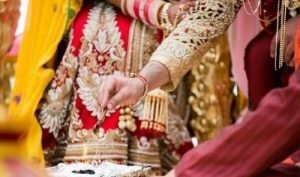 During the Kanya Danam ceremony, the bride’s father gives custody of her daughter to the groom, who promises to assist the girl in the realization of the three sacred nuptial objective: Dharma, Artha and Kama. At this point the Vivaaha-homa begins. It consists in the lighting of a sacred fire, essential element in the principal and central part of the ritual: Saptapadi (seven steps around the fire), in which the couple makes seven steps around the fire, each of them accompanied by a prey and seven promises. 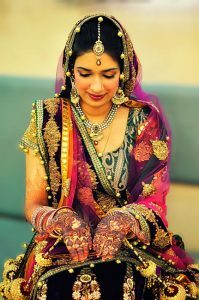 In the end the groom ties around her wife’s neck the mangalasustra, a necklace with the symbols of Shiva and Vishnu, that represent the emblem of married woman. This condition is also emphasized by the Sindoor, a red powder that the groom apply on his wife’s central parting and forehead. 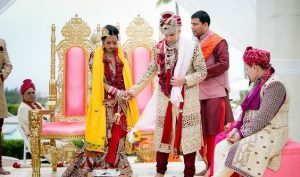 The nuptial ceremony concludes with the Aashirvaad: groom’s family offers gifts to the bride and the guests throw flowers’ petals towards the new couple, that after the reception reach their home bringing with them, in a brazier, the sacred fire in front of which they get married. 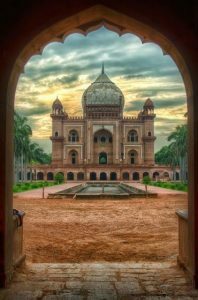 If you’re curious to discover other traditions of Indian culture, just write to me! 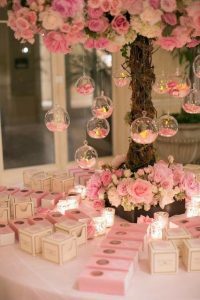 Floral arrangements are of course the most normal choice to decorate a wedding. In each shape or shade, they can fascinate everyone with their simple, undeniable beauty. Unfortunately, they’re not always also the most economic option. 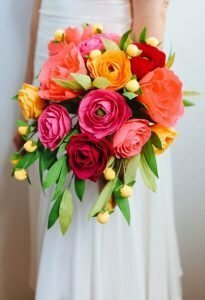 Flowers are in fact needed for ceremony and reception’s location, bridal’s bouquet, boutonnières and centrepieces, so that is necessary to spend a considerable amount of money. Luckily exists a more economical solution, able to substitute or enrich floral arrangements without sacrificing their scenic effect: paper decorations! 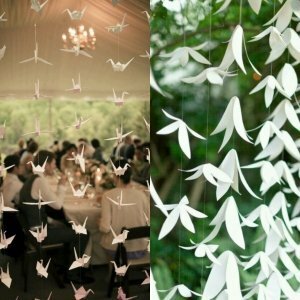 Homemade lovers already know it, with paper and imagination is possible to realize each kind of decoration. 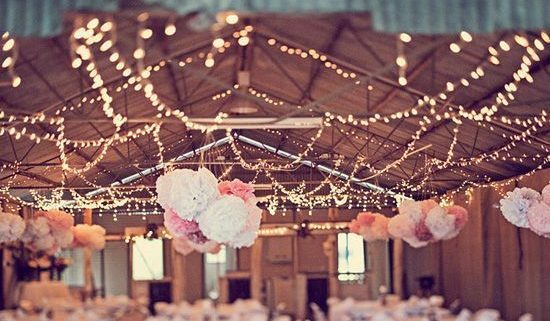 Festoons are the most simple and immediate and they can be hung to the walls or used for hanging ceiling arrangements. 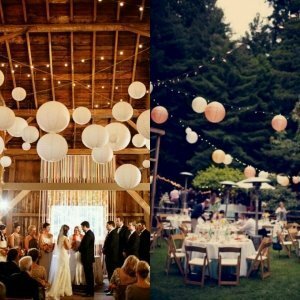 In addiction, or in alternative, to the festoons, lanterns or paper honeycomb balls can be utilized. They can be realized in many dimensions, and are wonderful both for interiors and exteriors. 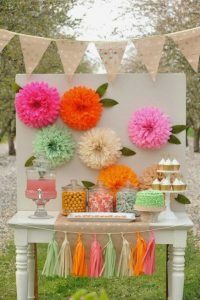 For the people who prefer to adorn lateral areas, paper garlands are ideals: they in fact assume, in addition to a decorative role in the location, a perfect background for photo shoot and photo booth, creating unique memories with friends and relatives. They’re created in many models, origami’s, boats’, ice creams cones’, and the ones who consider flowers fundamental can opt for the gorgeous paper flowers! They’re already a trend overseas, and appeared for the first time in 2009 during the Chanel’s runway show. Paper flowers are ideal in many events, and adapt perfectly to each theme or palette: from pastel nuances to bright colours, two-coloured or monotone, created in different dimensions depending on their use. 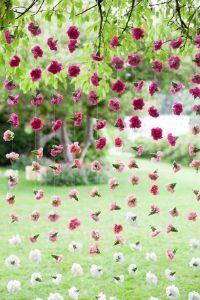 Small or medium sized paper flowers are used for festoons or garlands, large sized ones for hanging decorations or lateral walls, and in the end giant paper flowers, perfect for photo shoot or to embellish ceremony’s naves or arches. 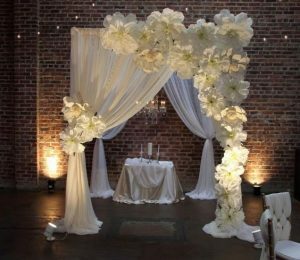 For a more realistic effect, it’s possible to add also the steams, in order to obtain “flowers” ideal for centrepieces, fable scenography and, why not, for the bridal’s bouquet too! 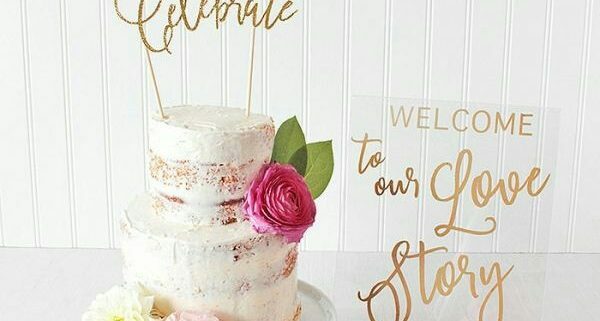 Unlimited possibilities for unlimited styles, from the romantic to the funny one, the vintage or the modern one, paper decorations arrangement can lend that original and refined signature, which will make unique your wedding! Imagine a temple in gaudy colours… wonderful cherry blossoms… an ancient and evocative melody… Imagine the smell of tea… an intimate and solemn atmosphere… bride and groom in kimono… Imagine a place whose culture, so suggestive and fascinating, inspired movies, theatrical works, books, that we all heard about. Well… if you’re imagining that… you’re already part of a Japanese wedding ritual! 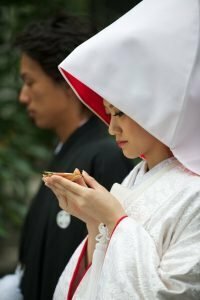 Actually, because of the different cultures that coexist in Japan, there’s not an only ritual which is valid in all the country; however the shinto ceremony is one of the most common, austere and full of symbolism. 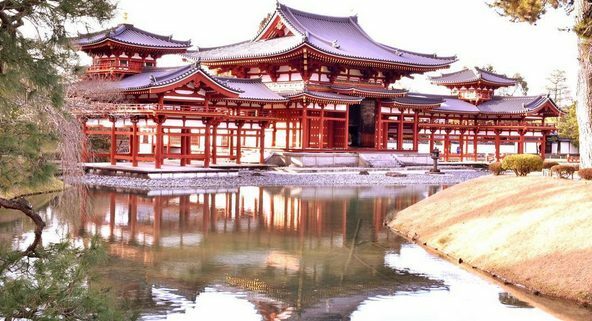 Shinto wedding is celebrated in a temple, where the bride, hanayome, and the groom, hanamuko, sit together, in the middle of the room, in front of the minister. Near them just the nakōdo, an elderly couple of acquaintances with the function of mediator between the bride and groom’s family. Parents and relatives sit at the sides of the room, quite distant, while the other guests wait outside. 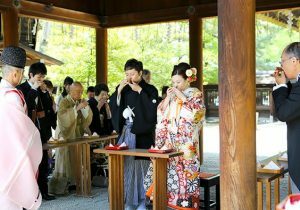 The culminating moment of the ceremony is the san-san-ku-do, literally “three-three-nine-times”, that consists in the exchange of nine cups of nuptial sake between bride and groom, who finally go to the sanctuary’s core in order to offer to the kami the sacred sakaki’s twig. 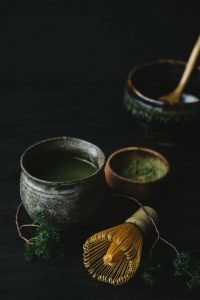 Another typical ceremony in Japan is the Tea Ceremony (cha no yu – “hot water for tea”), a ritual created in XVI century by the Buddhist Zen monk Sen no Rikyū, which consists in the preparation and presentation of matcha, green tea that is pulverized and blended with hot water using chasen, a specific bamboo whisk. This ceremony is usually divided into three moments: kaiseki, light meal eaten before tea; koicha, thick tea; usucha, light tea, the only moment that is generally celebrated because the entire ceremony would be too long. 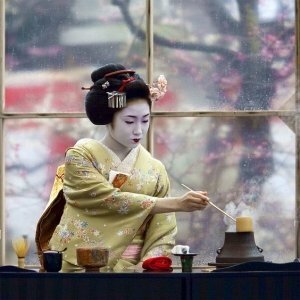 The usucha is celebrated by a geisha who prepares tea following and elaborated code of etiquette, and then offers it to the bride, the most important guest, to the groom, and in the end to the other invites. 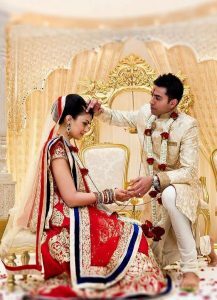 The uniqueness of these rituals is emphasised by the traditional clothing of the bride and the groom. 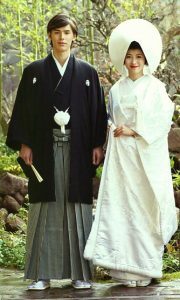 The groom wears the aori kahama, the samurai’s long pleated skirt with the black kimono-jacket. The bride wears instead the shiromaku, a sumptuous white kimono in brocade, symbol of pureness and availability to start a new life, meaning underlined also by the white hat, called tsuno-kakushi, wore upon the hairpiece. This is just a part of the wonderful wedding traditions in Japan. If you’re interested to receive more info, contact me on e-mail or facebook! White, synonymous of candour and purity, is the traditional and classic bride’s ideal colour. However the total white next year won’t be a trend anymore, especially for what concerns bridal shoes. 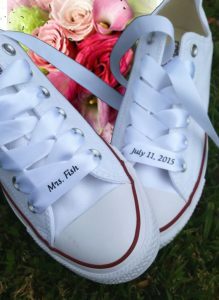 For a modern and original look, coloured, alternative and peculiar footwear is preferred, that the brides can reuse in other events or special occasions. 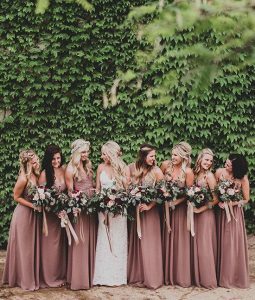 For the women with a delicate taste and a vintage/boho style, we suggest pastel nuances, in particular pale pink (a colour proposed also for the new wedding dresses), embellished with jewels, bright rhinestone or lace; which alternate with the romantic gold or silver shades, for a fascinating timeless look. 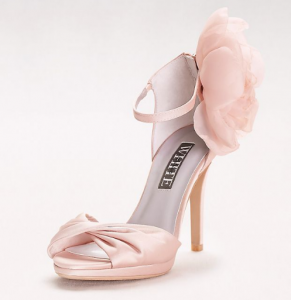 The model of White collection by #VeraWang is wonderful: a twisted satin peep-toes, decorated with a chiffon flower, available in blush or ivory. The Bridget 85 by #JimmyChoo are also gorgeous but more traditional: platinum ice dusty glitter round toe pumps, which magnificently work just as well with jeans as they do with sharp tailoring. 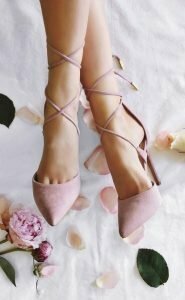 The rock and alternative brides may prefer footwear with vibrant, intense tones, in order to create an eccentric look and to make it entangling and captivating. For the women with a “dark soul” the black shoe is probably the best choice, even because black is getting a discrete success for the wedding dresses too. The “comfortable solution” is the most appreciated, in fact the brides will avoid exaggerated heels, leaving space for more moderate, but refined and elegant, heights. Sandals, decolleté and lace up, so fashion recently. 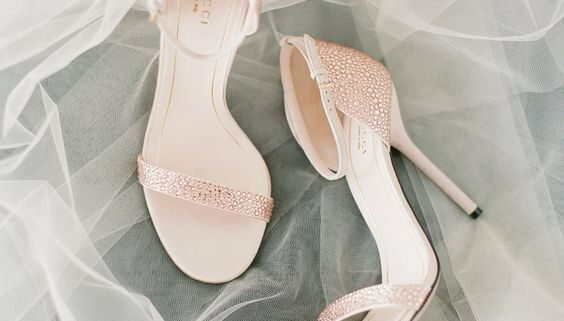 The brides allergic to any kind of heel who can’t renounce to originality, may opt for personalized sneakers or converse with white tulle or satin bow, beads, tags; as an alternative to the classical ballerina flat, that remain a certainty anyway, most of all in case of “uncomfortable” locations. 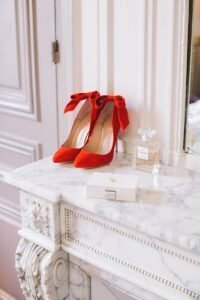 Moreover, they’re both flat shoes, so they’re ideal for a look change, when the bride wants to go wild with her guests or simply to return feet on the ground after a very long and tiring day…but always with style! 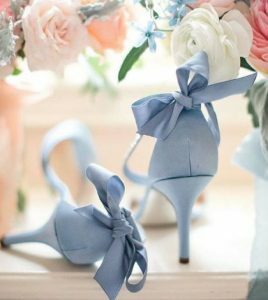 No matter what your choice is, it is it would be better to match the coloured shoe model with the tones chosen for the wedding, in order to create an harmony with all the elements that will surely make perfect your big special day! 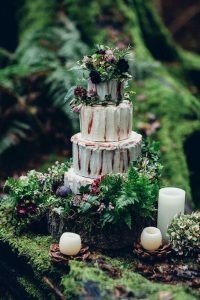 The party into the party, the highlight of the reception, the conclusion of an exciting event, and the opening for the dances: wedding cake party. 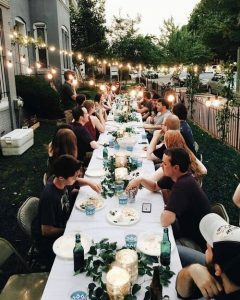 This kind of pary allows the newly married couple, to share the joy of the feast, dances and fun with a large group of friends and colleagues, with a lower economic burden in relation to complete receipt. 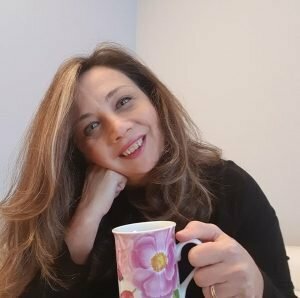 – coffee and pastries (if provided in the menu). She, the cake, is your co-star of the party and never as in this case has to be absolutely perfect! 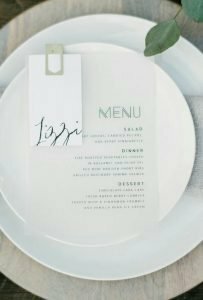 The size must meet the portions of the invited at the reception + wcp guests; the form must reflect the whole theme of the event and the taste should meet the approval of all. So my advice is to always bet on simple bases, with fruit or light creams. 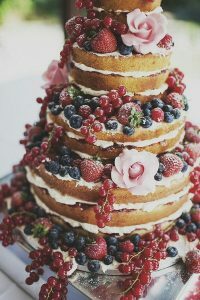 Have a nice wedding day! 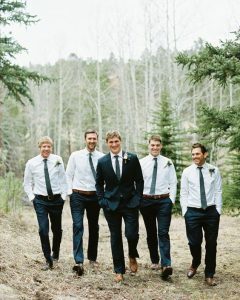 https://graceeventworld.com/wp-content/uploads/2017/01/52484b47a3571b595068f61e7931c793.jpg 747 600 grace http://graceeventworld.com/wp-content/uploads/2016/07/LOGO-FARFALLA-E-GRACEEVENT-world-su-fondo-bianco-2017-300x300.png grace2017-01-13 15:22:142017-01-13 15:22:14Wedding cake party!